Saudi King Salman bin Abdulaziz and Barack Obama in 2015. Do not believe a word of what you are hearing from President Obama and the FBI about a “final review” of the still-classified 28 pages from the original Joint Congressional Inquiry into 9/11. They have no intention of releasing those pages, which are a damning indictment of the entire Anglo-Saudi Monarchy, which engineered the Sept. 11, 2001 attacks on the World Trade Center and the Pentagon, killing 2,977 innocent Americans. President Obama is complicit after the fact in the cover-up of the most heinous crime committed on American soil. Nothing short of immediate impeachment and criminal prosecution is sufficient. The same is true for the top leadership of the Federal Bureau of Investigations, starting with former FBI Directors Robert Mueller and Louis Freeh, who played personal and active roles in the cover-up and protection of the British and Saudi network that orchestrated the attacks. This is not a matter of speculation. The 28 pages from the original Joint Inquiry present an indictment of top Saudi officials, including then Ambassador to the United States, Prince Bandar bin-Sultan. Prince Bandar, a self-professed British agent, was paid for his role in the Al Yamamah British-Saudi arms for oil barter deal with more than $2 billion in kickbacks. Some of those funds, transferred from the Bank of England accounts of the British Ministry of Defense's Defense Exports Support Office (DESO) to Prince Bandar’s personal account at Riggs National Bank in Washington, were passed along to two of the 9/11 hijackers through a Saudi intelligence officer. This is but a small part of what is contained in the 28 pages. LPAC Street theater for Manhattan: Obama joins her Majesty QEII in gathering signatures to keep the 28 pages classified. This is the tip of the iceberg. As Lyndon LaRouche first warned in January 2001, the Bush-Cheney administration was looking for a “Reichstag fire” incident to use as an excuse to rip up the Constitution and go for dictatorship. The British-Saudi apparatus ran the operation. The 28 pages from the Joint Inquiry were classified by President Bush, and President Obama has kept them classified for the past nearly eight years. Obama is desperate to protect the British and their Saudi assets, and he will do everything he can to refuse to release the 28 pages. A document released last summer from the files of the 9/11 Commission—“Document 17”—adds further urgency to the declassification. It provides added details about the Saudi top-down role, and details a vicious FBI cover-up of the efforts to get to the truth about 9/11. The Obama White House strategy is to stall any decision until the momentum for declassification of the 28 pages has died down. President Obama is personally guilty of covering up the authorship of the worst terrorist attack to ever take place on US soil. That is an impeachable crime. He cannot be allowed to get away with this. The 9/11 families deserve justice and full disclosure of the British-Saudi-FBI-Bush complicity. The very survival of the United States as we know it hangs in the balance. Do not fall for the Obama and FBI stalling game. Demand the immediate release of the 28 pages and the launching of a new, top-down investigation into the actual authors of the 9/11 attacks. If you want to defeat ISIS and end the threat of jihadist terrorism throughout the globe, indict the British and the Saudis by releasing the 28 pages. Congress should pass the JASTA—Justice Against Sponsors of Terrorism Act—and President Obama should be removed from office before he follows through on his pledge to the British and Saudi monarchies that he will veto the bill, which would allow the 9/11 families to sue the Saudi Monarchy for the crimes of Sept. 11, 2001. This is a showdown moment, and you must personally weigh in to demand the release of the 28 pages now! 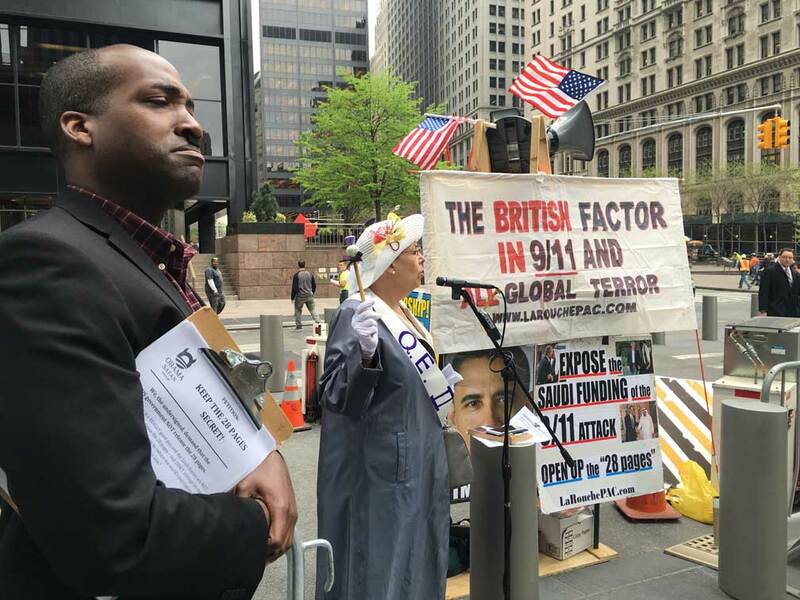 Don’t allow the Obama stall game to perpetuate the cover-up of the British-Saudi crimes of 9/11. Keep me posted, I want daily updates.